The autobiography of childhood written for children is a rare thing. Only Roald Dahl’s Boy comes immediately to mind. In this book, Jacqueline Wilson, one of the few modern writers to rival Dahl’s appeal, has also grasped the challenge. But this is a very different book. Boy takes Dahl past school to his first job and is presented as a series of carefully crafted stories, of which Dahl is always the hero. 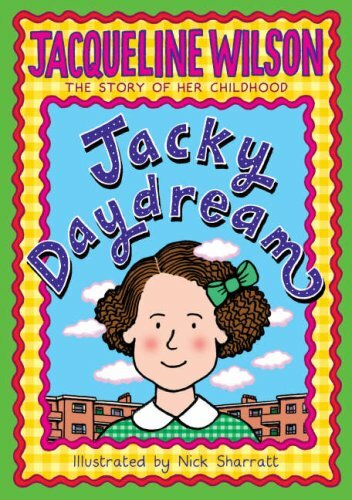 Jacky Daydream charts her life just to the end of primary school in brief chapter episodes largely in chronological order, although with short asides offering portraits of relatives and friends, descriptions of life in the convention bound world of 1950s suburbia, and her own preoccupations as a child (there’s a lot about dolls); always as someone slightly withdrawn from life. In the first chapter she describes how she might have coped with her separation from her mother immediately after birth, by making up stories – ‘maybe I started pretending right from the day I was born’. The link between life and fiction is underlined by each chapter closing with a question to the reader about a parallel moment in one of the novels. Although initially irritating, this gives fans familiar ground in a world of fifty years ago, linking readers back to the Jacky Wilson they know, and it acts as a taster for any novel they haven’t yet read. However, it may also be a sign of a lack of confidence in the power of this portrait of a child wrapping herself up in private worlds to hold a young reader’s interest. The book shows its author’s considerable strengths. She writes in the same deceptively easy, informal, confiding style that she uses for her fiction. Her social observation is as sharp, unsparing and understanding when dealing with her parents, her friends, her teachers and her young self as it is when dealing with the people in her stories. There are similar themes. There are even Nick Sharratt’s illustrations. But the Jacky of fifty years ago is not Tracy Beaker or one of her other feisty heroines. It remains to be seen whether the story of the real Jacky will prove as popular as the real Jacky’s stories.